Umbria in central Italy, is a region of lush rolling hills, hilltop villages and iconic, historic towns. 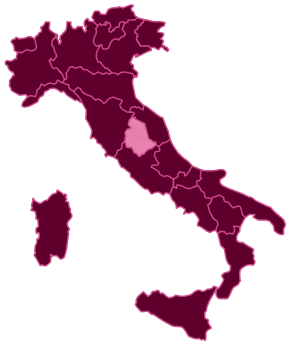 Its annual wine production is less than one third that of neighboring Tuscany, and makes it the country’s fourth-smallest wine-producing region by volume. Located at the very heart of the Italian Peninsula, it is hemmed in by its neighbors Tuscany, Marche and Lazio, and is in fact the only Italian region with neither a coastline nor an international border. The climate of Umbria is similar to that of Tuscany – cold, rainy winters and dry summers with abundant sunshine. The exception to this is the area west of Perugia, where temperatures are moderated by the waters of Lake Trasimeno. The majority of the region’s vineyard plantings are along terraces cut into the hillsides, which is reflected in a number of the area’s DOC names. Although best-known for its white wines, Umbria’s two DOCGs are for red wines. The native grape Sagrantino has gained prominence in the Montefalco area, creating wines of great depth and power, so it was no surprise when Montefalco Sagrantino received DOCG classification in 1992. The second of the region’s DOCG wines is Torgiano Rosso Riserva.